It seems like every coach has a business membership community these days, right? I’m no exception, but I do happen to think my community is exceptional. It’s big talk, and I absolutely mean it. Of course, I realize you don’t yet know how magical VIP is. I also know that investing in a membership is a big decision. You need to be certain it’s a space where you’ll feel comfortable and where you’ll get a good return on your investment. The truth is, VIP isn’t for everyone. In this post, I want to help you really understand the membership so you can decide if it’s right for you. That’s why I want to do more than just tell you about VIP. I want to give you a sneak peek at what you really get. 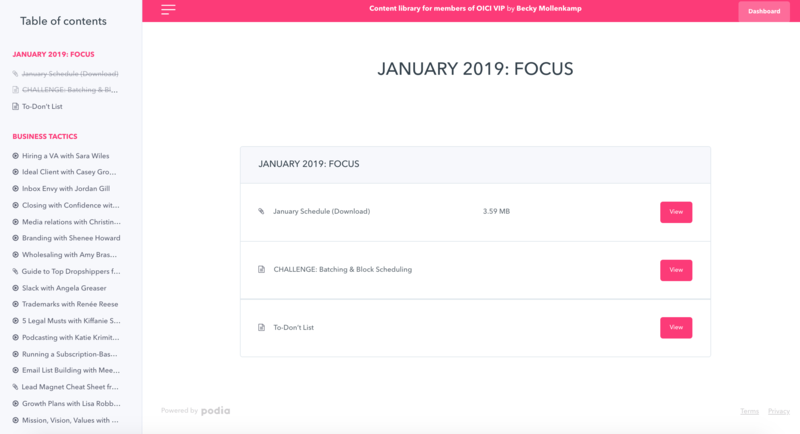 This post offers a peek behind the curtain by giving a snapshot of everything that happens in the group within a specific month (January 2019). Each month, the group has a specific theme (Focus, in this case). 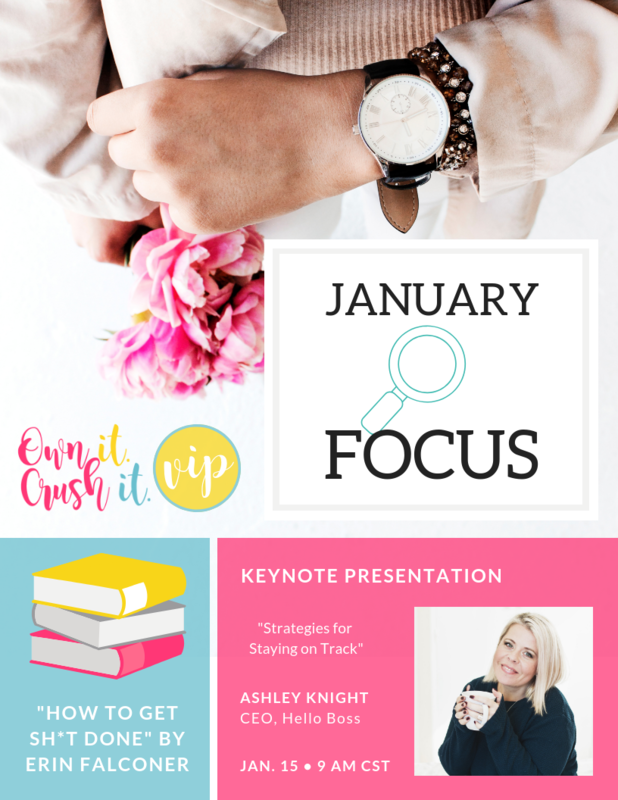 We read a related book together (“How to Get Sh*t Done” by Erin Falconer for Jan. 2019), participate in a monthly challenge together (here it’s creating & implementing block scheduling), and learn from a keynote presenter (CEO of Hello Boss Ashley Knight here). I also be share my best tips related to the theme. Each month is also dotted with other fun, inspiring, and practical activities—co-working, mastermind hot seats, book club chat, and a virtual mixer. Perhaps best of all, we kick off each month with a two-hour CEO Seat … it’s a structured group planning session where we map out your month so you know what you need to do each week to reach your goals. Every VIP member is assigned an accountability pod when they join, so they have a group of bosses invested in making sure they do what they said they would each month. Everything happens live, but I know it’s not realistic for most members to fit everything into their busy schedules. That’s why the events are also recorded and made available right away for watching at your leisure. The content lives on forever in the membership dashboard. 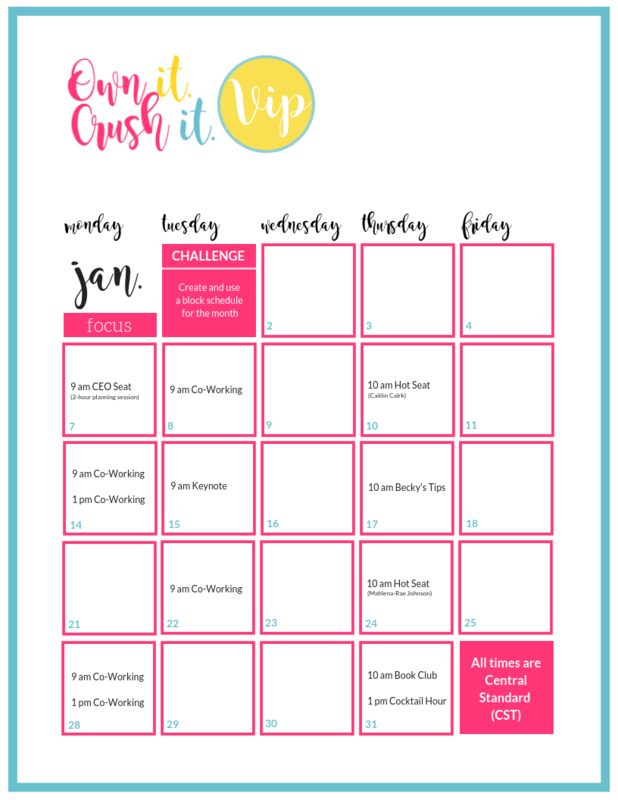 Members can access everything at any time—grab the month’s schedule, challenge information, bonus resources from me, and all the videos. Plus, members have access to an ever-growing library of masterclasses (there are more than 30 videos right now) from a bunch of smart guest lecturers. They cover general business tactics, social media tactics, mindset help, writing tips, and more. What I can’t show so easily is the community. That’s something you have to experience to really understand. As soon as you join, you get access to the private Facebook and Slack groups where a lot of the real magic of VIP happens. It’s a lot for only $75 a month (with no long-term commitment). I hope this gave you a good glimpse into what you’ll get and how you’ll feel when you join VIP. If you want in, get on the wait list. Doors only open three times a year, and you don’t want to miss one of those opportunities (the next enrollment period is coming in early December 2018). Having a small business is taxing, and not just on your pocketbook. If you’re like most small business owners, you can’t afford much help in the beginning. That leaves you to do much of the day-to-day work yourself. On top of that, you have to get the word out about your business. After all, the more people who know about you, the more revenue you’ll have and the better your chances of hiring some help. It might feel like you’re chasing your tail, but don’t throw in the towel. Check out these four tips to boost your brand awareness without breaking the bank. Social media is an inexpensive way to build brand awareness. Ads allow you to target a specific location so people who live in that area will see it in their feeds. While putting money behind your ad campaign will help a lot, you don’t necessarily need to spend any money, and can instead grow your following organically. Be sure to research your audience before you decide which social media platforms are right for your business. You don’t want to waste time using the wrong platforms, and you definitely don’t have time to try to use all of them. Use social media to engage with customers and get to know them in addition to advertising for your business. Build a relationship with your customers instead of coming off as too self-promotional. Make sure your posts show the value customers will get. Use bold images with bright colors to stand out in people’s newsfeeds. Remember to respond to all customer questions, comments, and queries—even the negative ones—in a timely manner. Like social media ads, direct mail also lets you target a specific neighborhood. Unlike social media and email, though, direct mail typically gets noticed easier. Direct mail also has a longer shelf life than a digital ad because people tend to keep it to refer to later. It’s important to make your mail stand out. Put it in a branded envelope using a script font to address it. People will be more likely to open it because it will look like a personal letter instead of an ad. To that end, use a real stamp instead of a bulk mail stamp. Use direct mail to introduce people to your brand by inviting them to check you out on social media, inviting them to an upcoming event, or giving them a coupon. Community service serves two purposes. First, it helps others. Second, it gets your name out there. The scale in which you want to serve the community is up to you, depending on your time and your budget. One of the more elaborate ways is to organize some sort of area cleanup. It can be in the area of your business or somewhere in your neighborhood, such as a local park. A little less intensive method is to organize some sort of collection. You can accept canned food for local shelters or soup kitchens, pet food and supplies for animal shelters or backpacks and school supplies for area schools. The easiest way is through money. Accept donations and offer to match them up to a certain amount, or offer a portion of your proceeds during a designated time to charity. If you’d rather give time, you also can offer to sit on the board of a local charitable organization. Not only does this get your name out there, it also allows you the chance to network with other board members. Now it’s time to take your brand to the streets! You have to drive places anyway, so you might as well get some advertising in for your brand at the same time. Consider using your vehicle as a mobile billboard with custom window decals, magnets or wraps. You can choose a specific product based on your budget and what will work best with your particular vehicle. This gives you the opportunity to reach everyone along your commute each day, as well as others when you’re out running errands; imagine all of those bumper stickers, vanity plates and window decals you observe in your daily travels. Plus, it will definitely get noticed during a traffic jam. Be sure your vehicle design is consistent with all of your other marketing materials. Most importantly, make sure to be on your best driving behavior. You don’t want anyone to associate negative feelings with your brand because you cut them off in traffic. Owning a small business is a lot of work. There’s more to it than opening a shop and making sure you have enough inventory. You have to get your name out there. But, as the saying goes, “you have to spend money to make money.” There are many ways to do that, but hopefully, these four tips will help you boost brand awareness without breaking the bank. It’s never easy to do, but sometimes we business owners have to fire clients. There are a lot of reasons why it can happen, and none of them make the process any less difficult. In my latest Mindset Minute for my YouTube channel, I’m sharing a few tips for identifying when it may be time to fire clients, as well as a few strategies for doing it right. 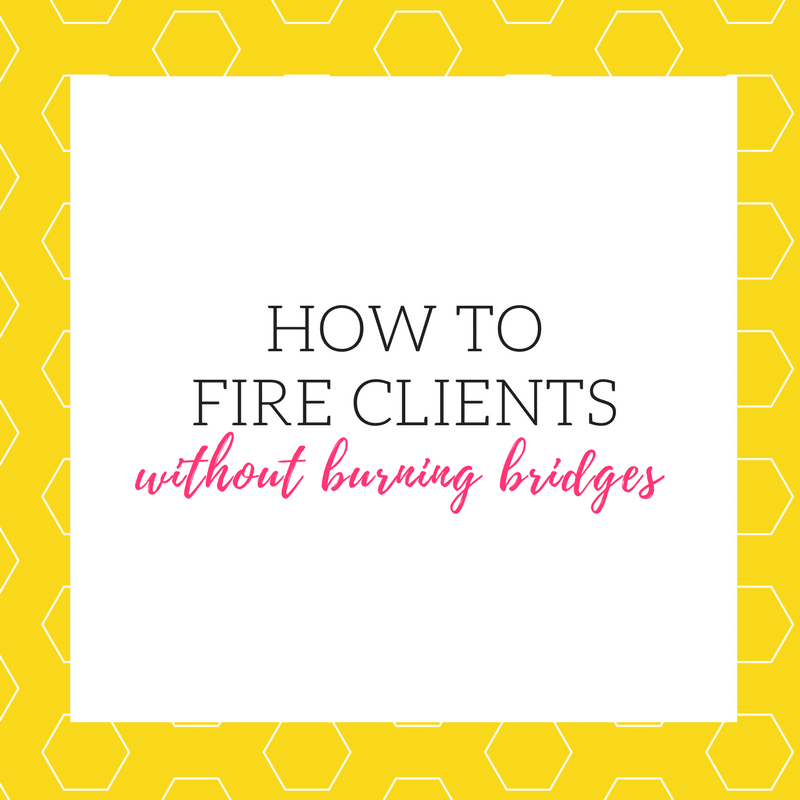 It is possible to end the client relationship without burning a bridge. To make sure you find out about my latest YouTube videos, subscribe to my channel! Often times, we business owners approach advertising in an overly generalized manner. I want to share a few thoughts on marketing to your niche target in a more effective and deliberate fashion. Start by building your target audience. The idea is to start general, but refine your audience as you narrow down who you’re seeking out. Let’s say you’re a 27-year-old fashion consultant in a smaller metro area. Immediately, you may identify upper-class women aged 35-50 in the nearest larger metro. Next, identify more details about her like activities related to expendable income, like fitness classes at an elite health center. A woman who attends health facilities is obviously health conscious and may have a certain image she wants to project. That’s the easy target. Now, how about identifying wild-cards targets—relatively outlandish ideas of who may benefit from your service. For example, that same fashion consultant might consider offering courses on professional attire at local businesses or the library. Even more adventurous? Speed dating events, where she could do a quick talk on what’s hot vs not on a first date and raffle off a free consultation. Ready for another? Travel agencies. Who doesn’t need a little help to rock the hottest fashions while on vacation? Give agents a free consult to prime the well, and leave cards with them so they can share with their clients. I’m sure you see where I am going with this. The idea is to forget what you know about the typical target. If you already know who that is, move on to who else you could connect with. Now, let’s transition to the meat and potatoes of marketing—your digital footwork. I’d like to start with Facebook, which has maintained its footing even as new social media platforms come and go. Facebook, in my opinion, is the holy grail of marketing. *Disclaimer: You should always focus on building relationships. Avoid posting spammy ads in groups and not participating. Seek out your target, but actually engage with them. Click, comment, like, and share. Create an impression and be memorable. Even if someone can’t personally use you, the relationship you build with them will allow them to think of you and make recommendations. If you have a business page on Facebook (get one now if you don’t), post regularly and share the content on your profile as well. Encourage your family and friends to engage directly with the business page, not the shared post. Remember to encourage your friends and family to select “see first” when following your page. Also, don’t be afraid to get personal and share real life stories. I love hearing from fellow mom bosses that their kids make them crazy. That I’m not the only one with a strange obsession with coffee. Your audience will also appreciate these things. It’s a deeper connection with immeasurable return on investment. Another platform to have an active presence on is Instagram, which is an incredible resource for visual elements. It opens the door to networking with other professionals. Thanks to apps like “Textgram” you can create notes and share them on Instagram as an image. Here’s where Instagram edges out Facebook—hashtags allow you to more easily put yourself in front of your targets’ eyes. If you’re a realtor trying to sell a 3-bedroom, 1-bathroom townhouse, for example, you can post a collage of photos and use hashtags (#newlyweds #firsttime #homebuyer #starterhome #college, etc.) to get in front of your ideal client. Hashtags also help you search and connect with like-minded professionals or potential clients. The important thing to remember is to explore and test all platforms to see what works for you and be creative. If there is no other takeaway, remember to be creative. Think about everything in terms of ripples in a pond. Now, go forth and kill niche marketing. Paula Creed-Smith is the owner of Ceh~Flora Gift Co., a gift box company located in sunny Florida. She’s wife to her Italian fox, Sheldon, and mother of two divas in the making, Azzaryha and Lael. Paula was formerly involved in social work after being inspired by her time in foster care during her teens. Once Paula became a mother, she opened her first company, At Your Service Personal Concierge. After a few years, a family health crisis encouraged a pivot in her entrepreneurial plan and she launched Ceh~Flora. In her spare time, she enjoys hanging with her hubby, playing with her girls, eating sushi with her mom, and singing at her church. Paula admittedly has a deep affection for all things coffee related and rum raisin ice cream. To get you in the mood, I’ve rounded up a handful of quotes from heavyweight entrepreneurs on love, passion, and even dating. I hope you find some humor, inspiration, and joy in this mix. And be sure to come back Thursday, when we return to our regular hard-hitting, deep-dive content to help you grow your business. BEFORE YOU GO: Are you ready to get serious about email marketing? Get some helpful hints for how to grow your list by downloading my free checklist. Whoever said, “there are no stupid questions, just stupid people,” was stupid. There are plenty of stupid questions, and they are among the most powerful tools you have at your disposal for creating a successful business. Here’s the truth: No one knows your business as well as you (nor should they). Unfortunately, many companies talk to customers and potential buyers as if they are coming to the table with the same knowledge base. This critical mistake may turn off your target audience and leave them feeling misunderstood and overwhelmed. As a content marketer, I help companies share information about their products and services. One of my biggest pieces of advice is to ask stupid questions about your business before you start talking about it. This process, which can uncover useful information, requires some humility. It may feel stupid to ask your target audience (or even friends and family) questions like, “why would you buy my service” or “how does my product work,” but the answers are critical for creating messaging that sells. Get in front of as many people as possible, even those you don’t consider a target market. Sometimes the stupidest (and best) questions come from the unlikeliest sources. Let everyone play with your product or hear about your services, and use your website. Then give them permission to ask you anything. The people using your product or service don’t share your encyclopedic knowledge about it, but their experiences are far more important. After all, if they don’t understand and love what you have to offer, then selling to them is impossible. Listening without judgment is key. Remember, these are probably going to sound like stupid questions to you but there is something to be learned if only you curb your instinct to explain, justify, rationalize, or roll your eyes. Take notes on everything you hear, even if it seems totally silly to you, and watch for trends. If more than one person asks the same stupid question, it’s probably not so stupid after all. By now you are probably thinking, “she’s just describing a focus group.” That’s true, it just happens to be a more organic, valuable, and cheaper DIY version. Long before you can afford to hire a big marketing firm to organize a formal roundtable of targeted users, you can empower yourself to improve your product using useful data from real-world users. So the next time you find yourself saying, “that’s a stupid question,” stop and explore whether it might actually be an opportunity to improve.